1. Pre-heat over to 350 F. Cut out as much of the cabbage core as possible, this will help when separating the leaves. Bring a large pot of water to a boil and drop the cabbage in. Remove once the leaves begin to separate. Peel off each leaf and set aside on paper towels to dry. You may have to repeat this process a few times to get the leaves off by re-adding to the boiling water. 2. Mix the ground turkey with the eggs, onion, garlic, salt and pepper. Spoon a portion into each cabbage leaf and roll up, folding each side in as you go to close it up. Place the rolled cabbage with the seams down on a baking sheet and bake for 1 - 1.5 hours in the oven or until turkey is fully cooked. 3. Cook desired amount of white rice in a rice cooker or pot following the instructions on the package and heat tomato sauce in saucepan when cabbage rolls are almost finished cooking. 4. Let cabbage rolls cool down, then serve over white rice and top with tomato sauce. 1. Mash together egg and bananas with fork or in a blender to get the mixture extra smooth. Add in the protein powder and PB2. 2. Spray a small non-stick pan with cooking spray and place on the stove over medium heat. Pour about one cup of pancake batter into the pan and cook until the edges begin to bubble then flip over and cook until done. Repeat until you've used all of the batter. 3. Enjoy plain or with your choice of topping! 1. Thinly slice the green portion of one scallion and 1/2 of the white onion. Grate one teaspoon of ginger and chop a handful cilantro. Mix together. 2. 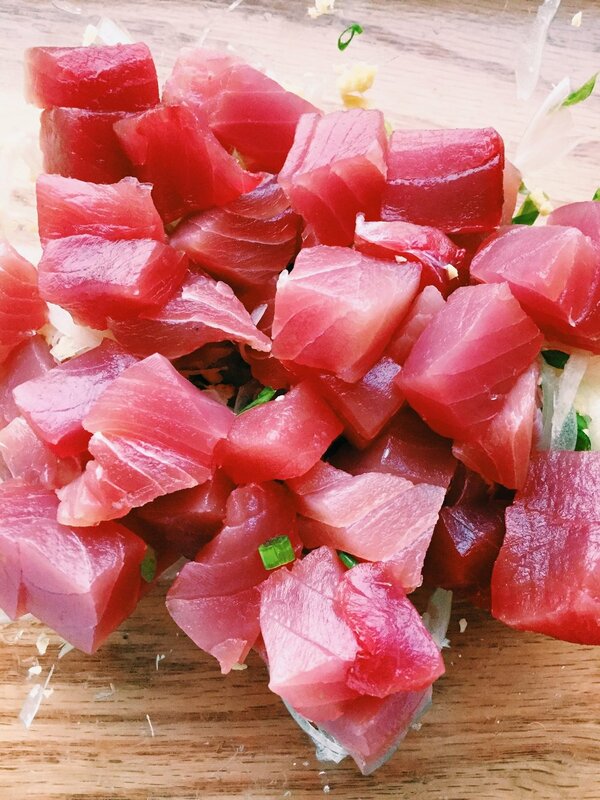 Cube your Ahi tuna and mix in with the other ingredients. Add the soy sauce, sesame oil, sesame seeds, salt and pepper and mix everything together. Set aside in the fridge for about an hour. 3. 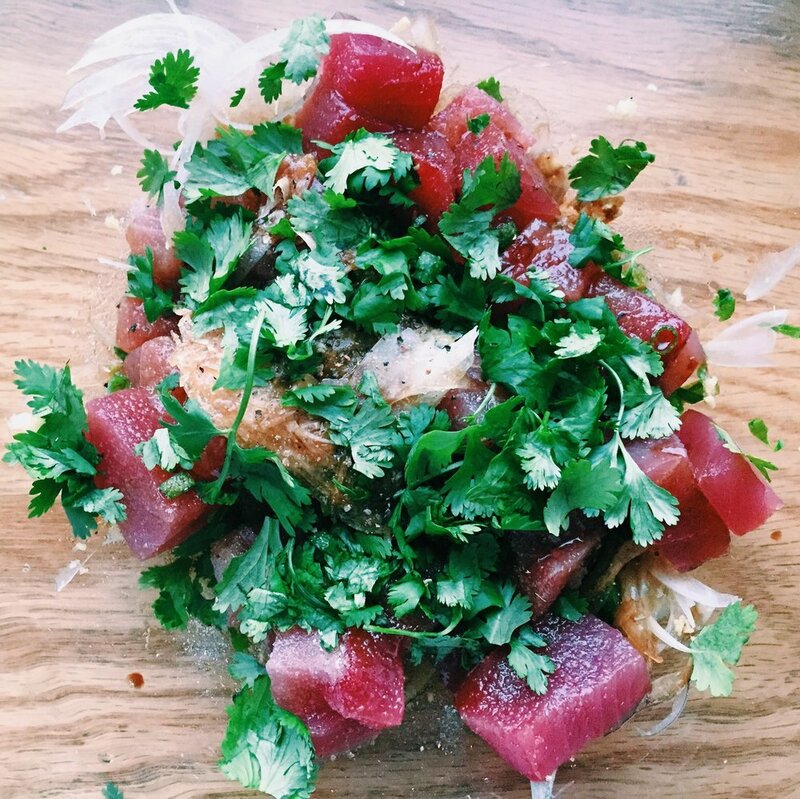 While the Ahi Poke is in the fridge, prepare the rice according to the instructions on the package. 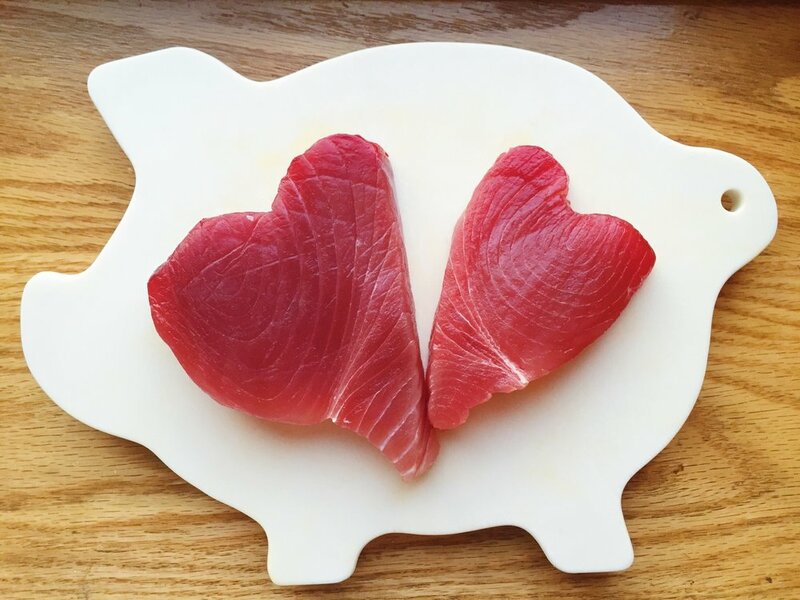 Once tuna has set for an hour, serve in a bowl over white rice.